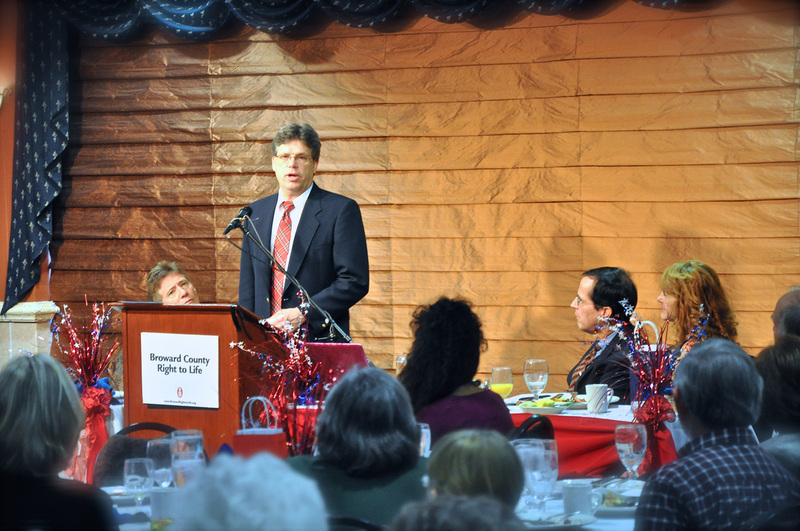 Scott Klusendorf challenged attendees at the 2012 Broward Right to Life Benefit Breakfast to be effective pro-life apologists. Everybody needs to be a pro-life apologist," Scott Klusendorf told an audience of 270 people who gathered on Sat., Nov. 10 for the annual Broward Right to Life Benefit Breakfast. "We all must know how to make a case for life," said Klusendorf, one of the nation's leading pro-life apologists. Doing so, is critical, he said, because "We are not winning" the pro-life battle. Klusendorf also cautioned the crowd that, with changes in Washington, "the price of being pro-life is going up." In his 45-minute talk, Klusendorf helped the audience to think clearly about the issue of abortion, pointing out, first, that the real question is "What is the unborn." It's a question answered, he said, through the science of embryology which shows that the embryo, from fertilization on, is a "distinct, living, and whole human being." Klusendorf also provided a quick guide to making the pro-life case by use of the acronym SLED, which stands for Size, Level of Development, Environment, and Degree of Dependency. Mere size, he said, does not disqualify someone from being a part of the human family. If level of development can be used to diminish someone's right to life, then young children who are not physically, emotionally, or intellectually developed are also at risk. As to environment, "Where you are has no bearing on who you are," Klusendorf said. Finally, he used human Siamese twins who are highly dependent on each other to show that dependency does not devalue one's humanity and is not an argument to remove the right to life from unborn children. Klusendorf, president of Life Training Institute, is the author of The Case for Life, and explains on his website "How to Defend Your Pro-Life Views in 5 Minutes or Less." Making the case for life, Klusendorf said, is one way we can love our unborn neighbors and their mothers. And defending life with the force of logical reasoning can also open the door to proclamation of the Gospel, he said.